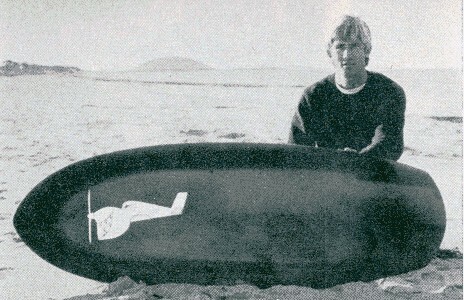 1973 Jackson Spoon Knee Board 5 ft 5"
SHAPER: Unkown, possibly Laurie Byrne. Purchased Nowra Tip, March 1999. 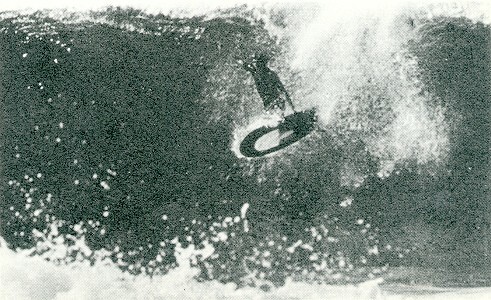 Badly stained, extensive damage and no fin but position and the base length was indicated by remnant rovings. The severe rail damage was foam blocked and repairs in Volan glass. The fin was replaced by the fin removed from # 37. 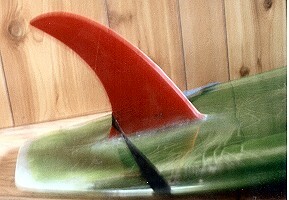 Sanded, glossed and polished by Jackson Surfboards, December 1999. Foam block repairs June 1999, larger image below.